NEW YORK (Reuters) - Move over inflation and job growth. The next Federal Reserve chief appears set to direct the central bank's might at ensuring financial stability and stern banking oversight with the same vigor it currently applies to its traditional mandates of fostering price stability and maximum employment. The question of monitoring and stabilizing Wall Street was a dominant issue during Fed chair-designate Janet Yellen's confirmation hearing before a Senate committee on Thursday. Yellen, widely expected to win Senate backing for the job, said financial regulation should be on par with monetary policymaking on the Fed's list of priorities. The central bank's current vice chair, Yellen appeared willing to draw fellow governors on the powerful Fed Board into more decisions on stabilizing the still-vulnerable financial system. In a telling exchange with Sen. Elizabeth Warren, Yellen said it was a "worthwhile idea" to consider reinstating regular board meetings to tackle financial supervision, as was the case at the central bank in the 1990s. In strong language, she also said she was prepared to use traditional monetary policy tools such as higher interest rates to prick any emerging asset-price bubbles, and pledged that addressing too-big-to-fail banks "has to be among the most important goals of the post-crisis period." While Yellen and current Fed Chairman Ben Bernanke often speak of the need to do more to curb Wall Street risk-taking and erase the notion the government will step in to bail out massive banks that get into trouble, as it did in the midst of the crisis, Yellen's testimony hints at a new approach. "She was unambiguously clear on how the Fed has massively revamped supervision of big banks, and left me with the sense she will spend more time discussing macroprudential oversight with colleagues than in the past," said William O'Donnell, head of Treasury strategy at RBS Americas. "It suggested they would shift to a better balance of macroprudential and monetary policy." The Dodd-Frank law in the wake of the 2007-2009 financial crisis and Great Recession tasked the Fed with protecting the overall financial system from risks that could spill into the broader economy, something called macroprudential regulation. The 2010 law effectively doubled down on the central bank's regulation of Wall Street, even though Fed policymakers - including Yellen, who ran the San Francisco Fed at the time - failed to avert the crisis in the first place. Absorbing this fresh supervision task into the Fed's traditional dual mandate of stable prices and full employment has proven tricky: requiring banks to hold more and better-quality capital can for example clash with the Fed's desire for those banks to ramp up lending to spur investment, hiring and economic growth in the wake of the recession. There also appears to be internal disagreement on how best to stamp out financial risks. Dallas Fed President Richard Fisher is alone among U.S. central bankers in calling on regulators to go beyond Dodd-Frank and simply break up the too-big banks; and earlier this year Fed Governor Jeremy Stein set off a debate over whether the Fed should battle asset bubbles with tighter policies. 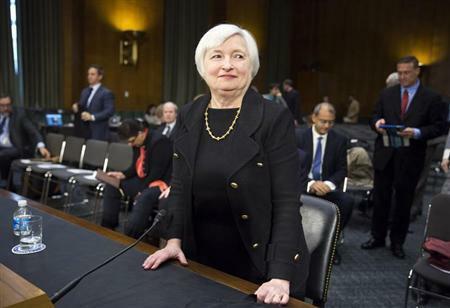 Yellen said on Thursday she does not yet see the broad buildup of leverage that threatens financial stability. Nor does she feel that U.S. stock prices - which are at record highs thanks in large part to the Fed's ultra easy policies - are in "bubble-like" territory. Yet toward the end of the two-hour confirmation hearing, Yellen told Warren the Fed's "supervisory capabilities are critical and they are just as important as monetary policy." She added that despite some logistical hurdles, it could be possible to better involve policymakers in key regulatory decisions that are usually handled by staff. "I remember in the 1990s that the board did regularly meet to discuss supervisory issues ... and I did consider those very valuable," Yellen said. "So I think that's a very worthwhile idea." Those regular meetings faded as the Fed under Alan Greenspan and in the early stages of Bernanke's chairmanship favored a hands-off approach to bank regulation. Yellen, who was president of the San Francisco Fed from 2004-2010, is still smarting that she and other regulators failed to "connect the dots," as she put it in 2010, between loose lending practices and a overpriced housing market that helped spark the crisis. Warren is an influential Democrat who made her name pushing tougher rules for banks, and she played a big role in the lobbying effort that knocked Yellen challenger Lawrence Summers out of contention for Fed chair earlier this year. At the hearing, the senator highlighted a $9-billion settlement the Fed and the Office of the Comptroller of the Currency reached with several banks accused of improper foreclosures. Warren criticized the decision to simply let staffers lead the effort, instead of having Fed governors vote on the deal. Such matters are typically handled by regulation experts at the central bank and spearheaded by Governor Daniel Tarullo, the Fed's point-person and chair of a three-governor committee on bank supervision that includes Stein and Jerome Powell. "Tarullo has been carrying this load virtually single-handedly," said Ernest Patrikis, a partner at White & Case and a former first vice president at the New York Fed. "The question is, will that change with more Board involvement in evolving issues and matters?"